One of my favorite memories as a child was making gifts for my parents for Mother’s Day, Father’s Day, and Christmas. I put my whole heart into those projects! Now, with five kids of my own, I love getting the gifts from my own kids. Not only do I have a tote filled with their picture art from many a celebratory holiday, but I have a pinch pot ring holder next to all of our sinks and on my nightstand, ready to receive my wedding ring when washing my hands, or going to bed. My favorite Mother’s Day Gift is a memory even more dear to my heart. Four years ago, just days before Mother’s Day, our oldest son Caden (then 12) had a 2-pound cancerous tumor removed from his liver. Because the ICU was so full that night, only one parent was allowed to stay. Wanting to celebrate Mother’s Day with my other four kids that I’d been separated from for four months to endure cancer care with Caden, I drove 3.5 hours to be with them, leaving my men in that small, sterile ICU. As I was saying goodbye to my Caden, grateful the 11-hour major surgery was over, grateful he was alive, I whispered I love you to him, wondering if he was still too sedated to really understand. Groggy and with slurred speech, Caden struggled to point at a gift Randy held out to me, a gift he’d purchased from the hospital gift shop the night before. “I love you, Mom. Happy Mother’s Day!” Facing major surgery, he took time to search out the perfect gift. He loved me that much. Because of my love of Mother’s Day Gifts, I thought I would share an inexpensive, simple gift your children could compile for the special women in their lives. 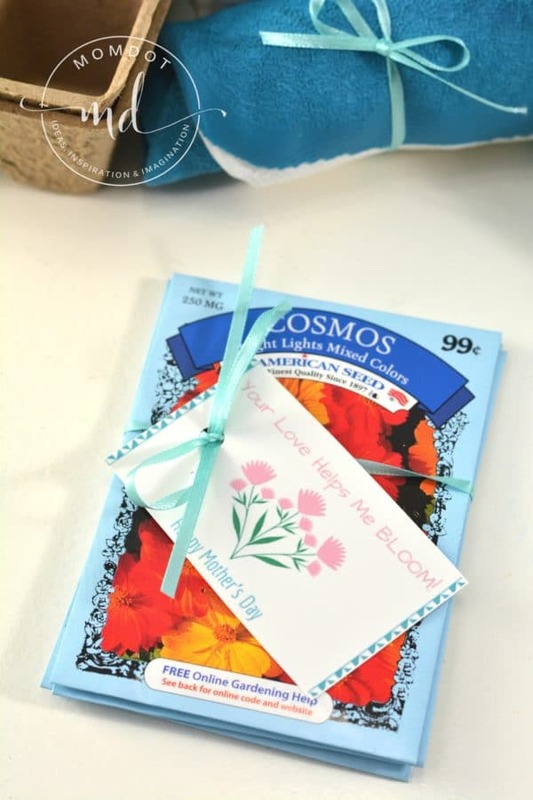 Using a skinny ribbon, tie your seed packets together, threading the gift tag so that it is attached on top of the seed packets. or small pots, and tie it closed with some ribbon. 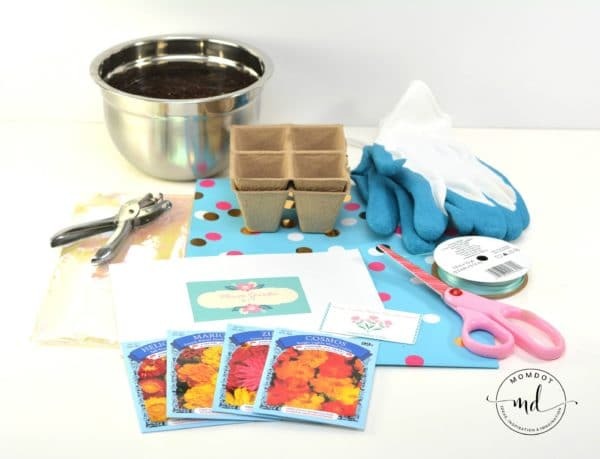 Helpful hint: To ensure that the potting soil is secure, you could always place the soil in a ziplock baggie, then place the baggie in the cellophane gift bag. the labeled gift bag, and top with some colorful tissue paper if you like. Happy Mother’s Day, my friends!